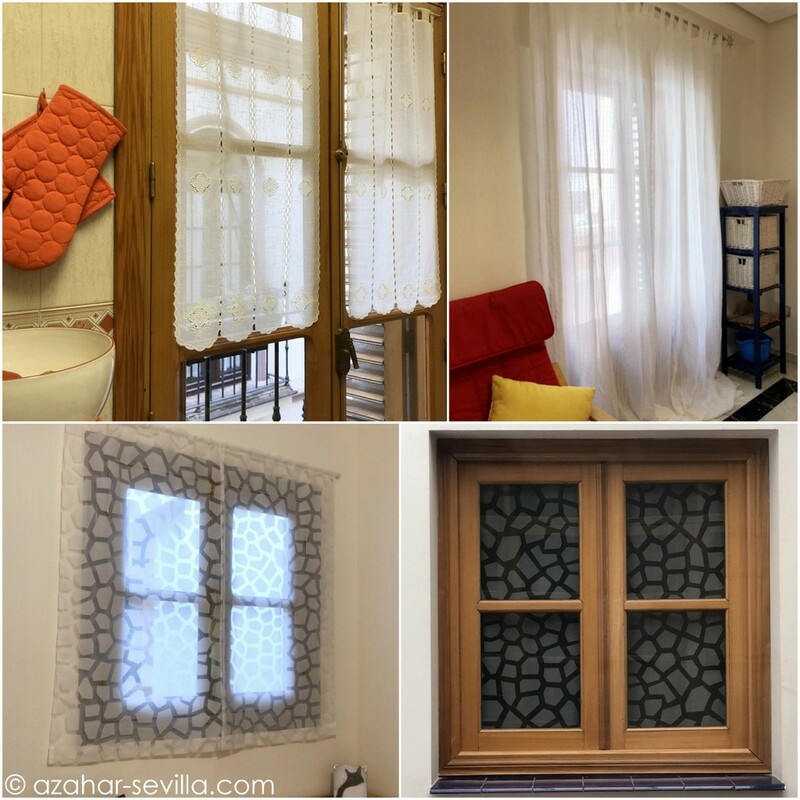 So now that I have been living in my new Casa Azahar for a year, I finally decided to put up some curtains, and of course it all had to be done in one day! Which almost happened. I mean, I found the curtains and rods, etc in one day, but it took a few days to get them hung. And here they are! Why curtains now? Well, the decision was kind of forced when I found out that my crazy neighbour downstairs has been “spying” on me with the camera(s?) installed by her alarm company. We share a patio space (she gets the actual patio, I get to enjoy the light from above) and at the moment she is away on holiday. Then the other day she asked her cleaning lady to tell me that she could see from her phone (!!!) that I haven’t been closing the patio awning at midday… whaaat?? To be honest, that kind of freaked me out. I mean, how much else can she see? So I decided to at least put up a curtain in my bedroom, that opens onto the patio, and which hadn’t seemed necessary before. I ended up finding a single long curtain panel that, cut in half, perfectly fit my bedroom window. And while I’m not really crazy about it, hey it just cost 4€, required minimal sewing and – bonus! – it looks super cool when I see my bedroom window through the patio windows and it looks like frosted stained glass. While I was at it I thought about some kind of window treatment for my kitchen. I really didn’t want CURTAINS, but my neighbour’s living room is directly in front of my kitchen. So I went looking for those embroidered panels you can cut to width (really didn’t want to have to sew much) and found some very pretty linen ones that perfectly fit over the top 2/3 of the balcony windows, meaning that I have privacy and still have lots of natural light, and I can still see my balcony herb garden. Then the guest room. Which faces the living room of a different set of neighbours. I probably wouldn’t have bothered with this room, but I had a spare set of unused IKEA curtains, and I remembered how much Morcilla loved to climb them at the old place. So up they went (still deciding on whether to hem them) and Morcilla has already started putting them to good use – saw the telltale claw holes this morning. I just hope this cheap rod is strong enough to hold her, to wit I put an extra support thingy in the middle today. I must be the only person ever to install curtains as a mini cat-gym. Pretty! And I’m glad there’s someplace for the little curtain climber to do her thing. But really horrified at your neighbor. Isn’t there anyplace in Seville where a person can live without contending with idiots? Haha… you know your boy! He’s already been caught “hiding” behind the bottom of the curtains (also chewing on them, of course). Good thing these only cost 12€.